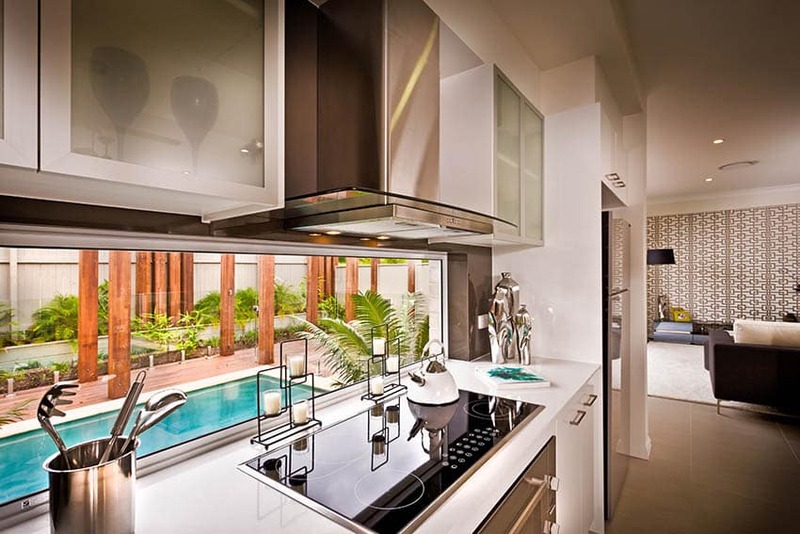 Here we showcase a variety of small modern white kitchen designs including a variety of layouts, cabinetry and finishes. No matter what era, design movement or style, white has never gone out of style. The versatility and beauty of white has been proven to be timeless & very easy to update and match with any other color. White is usually desired for its ability to make space look lighter and brighter, because of its ability to reflect light. In the contemporary setting, this is especially ideal for smaller spaces, as it gives the illusion of a bigger space. Another reason is that white looks “clean”, making it look easy on the eyes, and looks great when paired with other colors, patterns and textures. The only usual drawback when using white, is that dirt is easily visible from its surface, so you need to ensure proper maintenance. It also tends to look cold or boring, especially when there is no variety of shades and textures of white used. 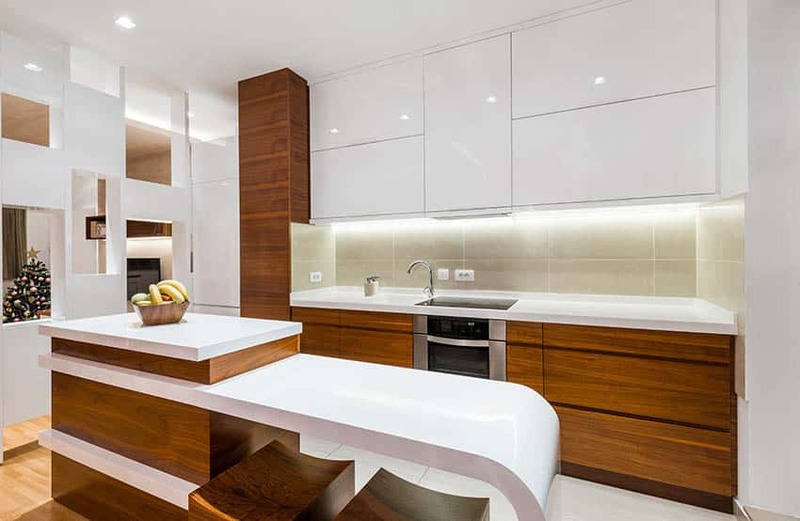 A medley of modern natural materials makes this all-white kitchen have a little more warmth and personality. The modular cabinets uses a white car-paint finish paired with stainless steel countertops, creating a very cool, sleep and shiny base. To subtly add a warmer feel to the space, a large block of solid wood ledge was used on the bar counter table. 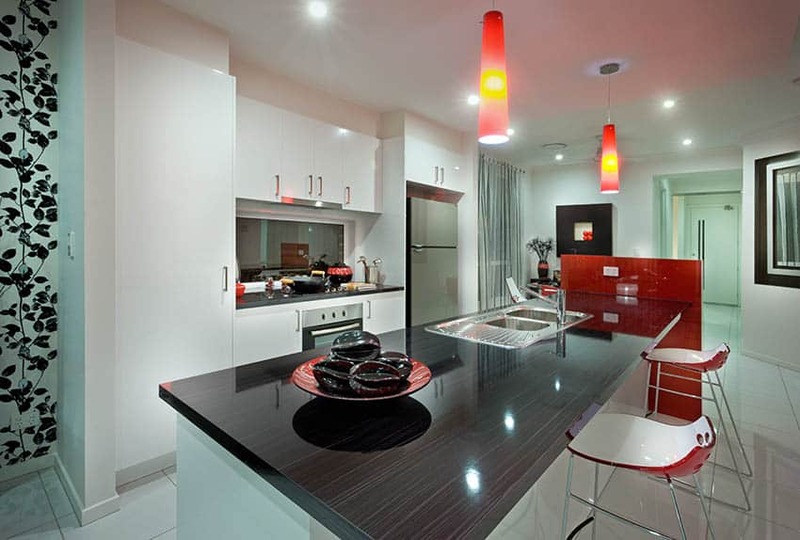 Modern kitchen cabinets are generally made using man made materials such as plastic, metal, glass or laminate. Many modern kitchen cabinets feature slab style doors with little ornamentation. 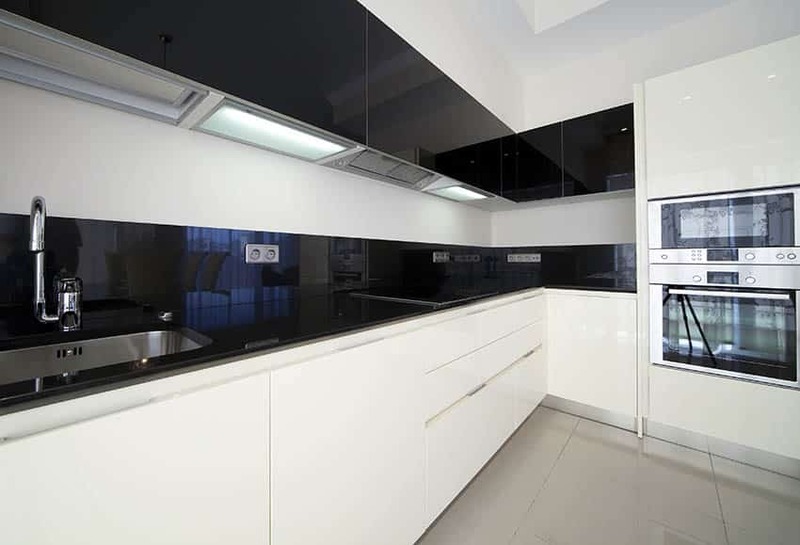 Flat sleek surfaces are utilized with an emphasis on a clean design. 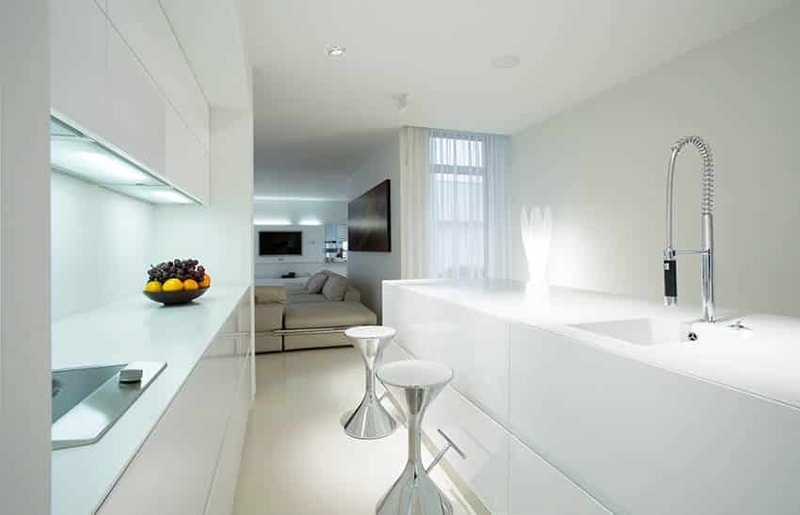 White is very ideal for small spaces such as this example. This narrow modern galley kitchen looks spacier that it actually is, as it uses an all-white color scheme and reflective finishes. Play around with light and color combinations and discover the many dimensions and looks you can create with white kitchen cabinets. 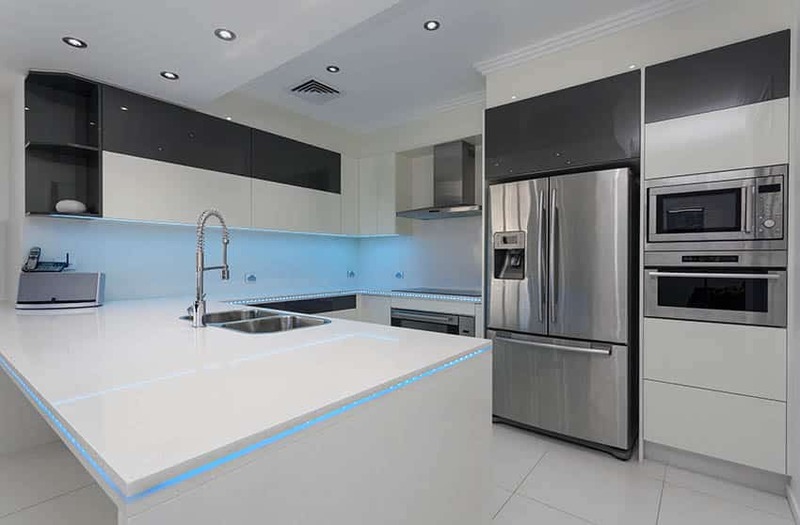 This design uses blue LED light to illuminate the undersides of the countertop, giving it a very unique glow. Dark gray cabinets were also used in combination with white to give it more depth. This small white modern kitchen offers a narrow peninsula for extra counter space with appliances that are hidden behind cabinetry. Countertops are constructed in a light gray solid surface material and contrasted against a dark gray tile backsplash. 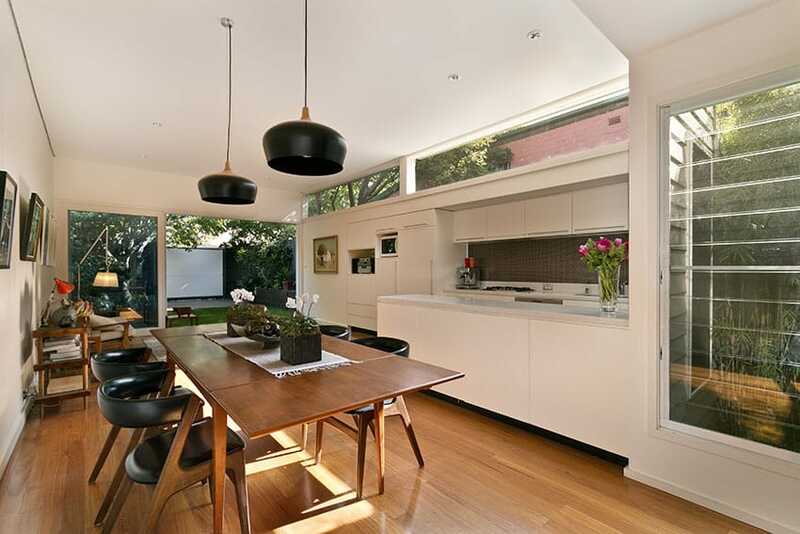 Light wood flooring runs throughout the kitchen space in to the dining area cereating a cohesive and stylish design. 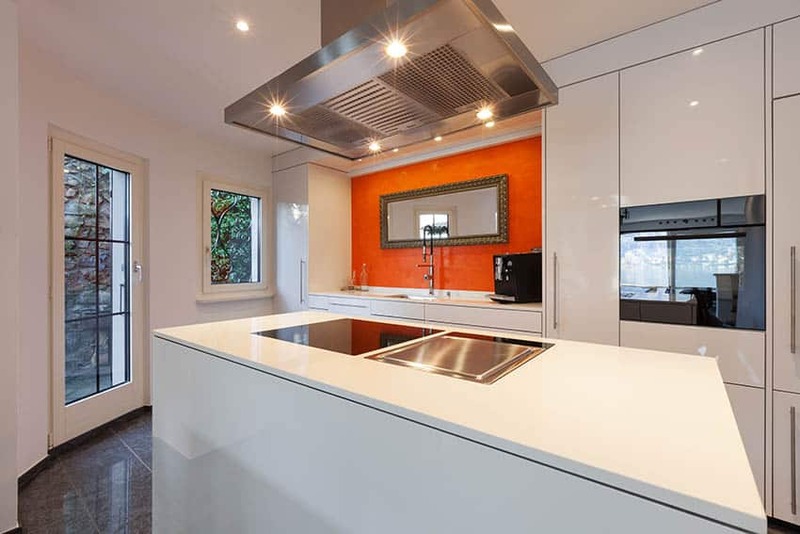 Another example of a galley kitchen using white high-gloss finish modular cabinets. The sleek finish looks even more eampless with the use of the continuous grab bars. The use of brown quartz countertop and brown marble helps add warmth and texture to the small kitchen. This compact kitchen gives a good example of how we can maximize small spaces for kitchen designs. Because of the limited floor area, the L-shaped kitchen (albeit curved in this example) counter also acts as the dining area. Reflective finishes were favored, to help make the space look bigger. This is all combined with gray flooring and dark wengue countertop to give it more contrast. 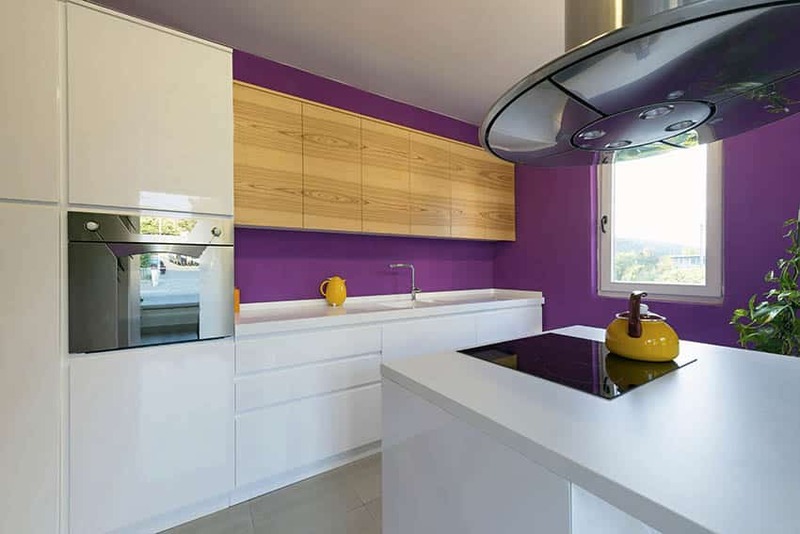 Adding a bright pop of color to your any surface, combined with white kitchen cabinets will instantly create a focal point. This example shows a bright red-orange wall, making it look light a bright frame around the mirror. 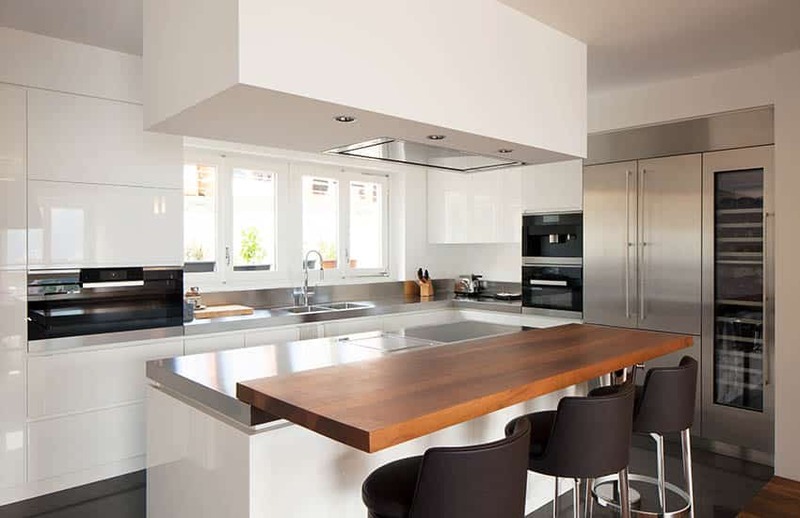 In modern kitchen designs, white and stainless steel finishes are staples, as they represent the modern look very well. This kitchen adds a little twist to the classic combination, but adding a black bar counter to add a bit of contrast to the space. White shouldn’t always be used exclusively or mostly on the kitchen cabinets to maximize its benefits. This kitchen is a great example of such, as the kitchen cabinets are mostly Teak wood laminated, while all the countertops and overhead cabinets are in white. 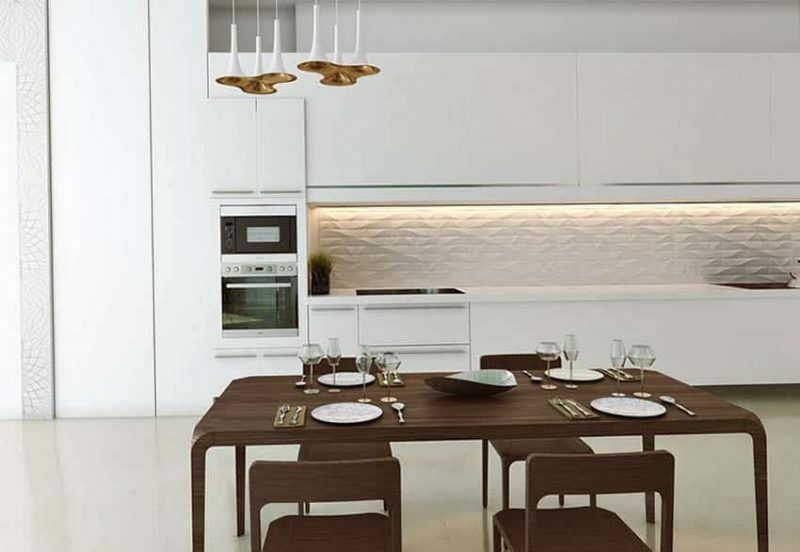 The balance between the natural tones and the modern white finish creates a warm yet sleek look. This is like a reverse of the previous example, as this tiny kitchen uses the wood laminates on the overhead cabinets instead. The dark oak color adds a subtle warm to the very compact kitchen design. Adding a bit of texture here and there can add more dimension to your all-white kitchen. This example uses black textured homogenous tiles on both the floors and the backsplash, as well as a faux stone accent wall on the side to give more depth to the all-white kitchen design. A gorgeous and creative way to add color to your all-white kitchens is through the use of large windows. In this kitchen, the backsplash wall was converted into a picture window with the view of the pool area, bringing in the bright colors of the pool indoors. The versatility of white is demonstrated in this small kitchen design. Violet is a gorgeous color often associated with royalty/regality, but can be tricky to use as it does not look good with all colors. 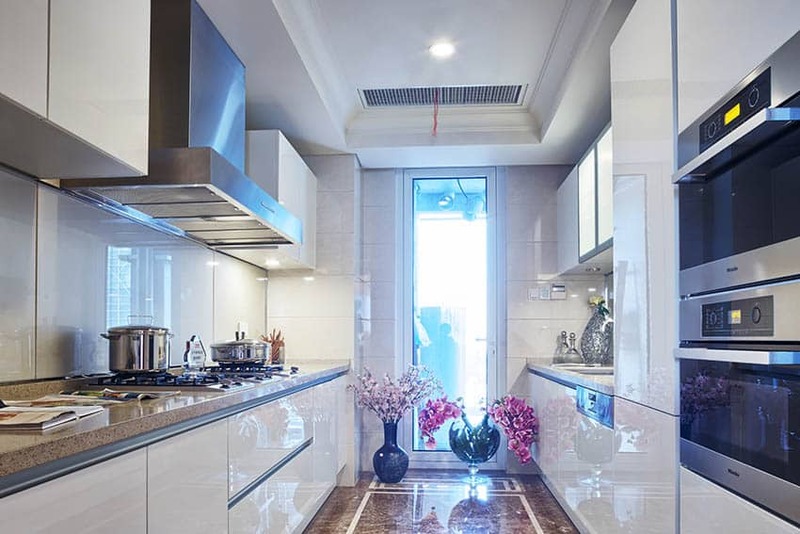 However, because white was used for the kitchen cabinets, it is able to seamlessly blend in without overpowering other elements of the design. 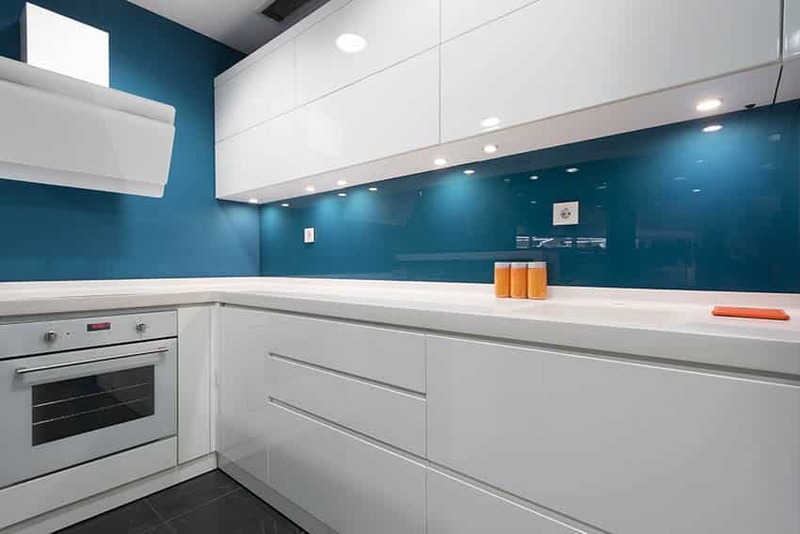 The blue-green back-painted glass used on the backsplash definitely gives a more fun and playful vibe to this sleek all-white modular kitchen cabinetry. 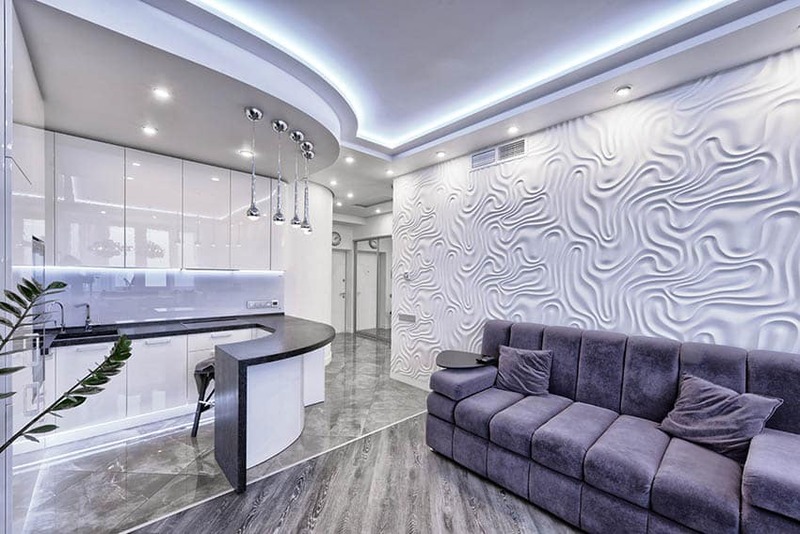 Red-violet is another difficult color to work with, but because of the pure white palette used on the modular cabinets, it helps tone down the boldness of the walls. A more matte finish was also used for the cabinet laminates to give it a softer look. Achromatic color schemes are easy to work with and very timeless. 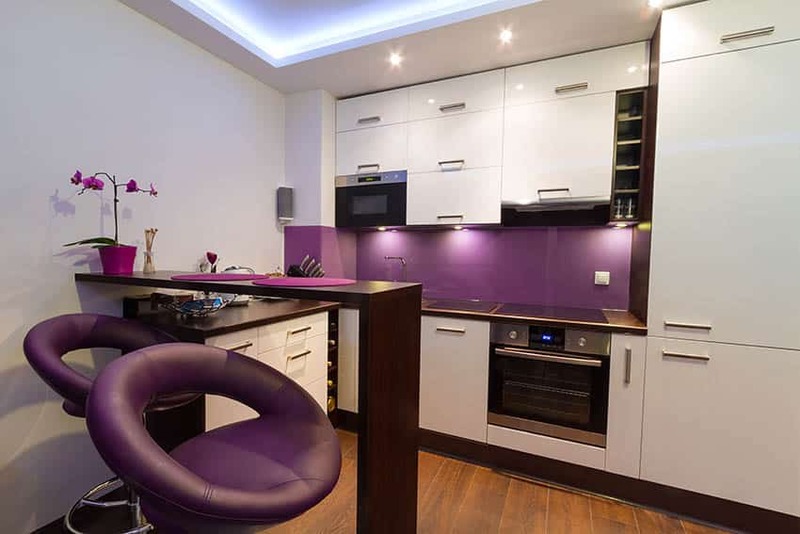 For spaces like the kitchen, it is a very popular and practical color scheme choice. 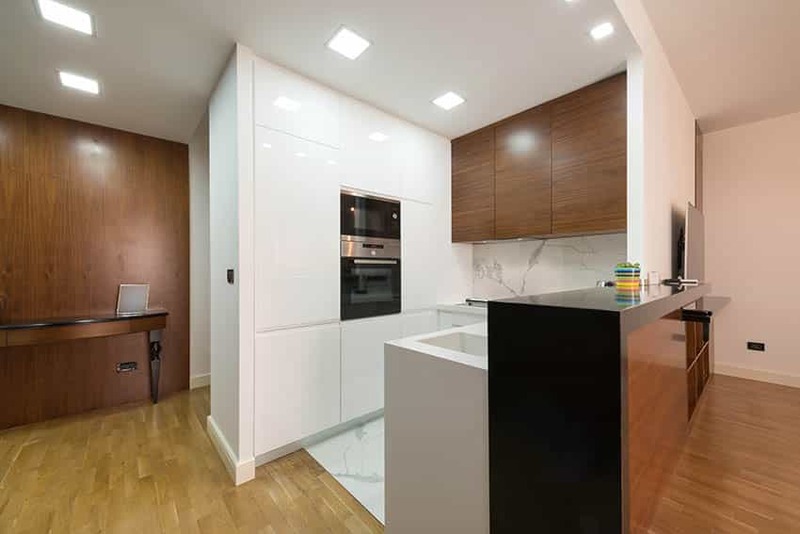 This example uses off-white/creamy modular base cabinets paired with black solid-surface counters and overhead cabinets. Placed right in the middle of the small space, this compact kitchen uses white-laminated cabinets to give the illusion of a bigger space. You will also see a few pops of reds used on accessories and furniture pieces, as well as a dark granite slab to add a bit of contrast to the surfaces. 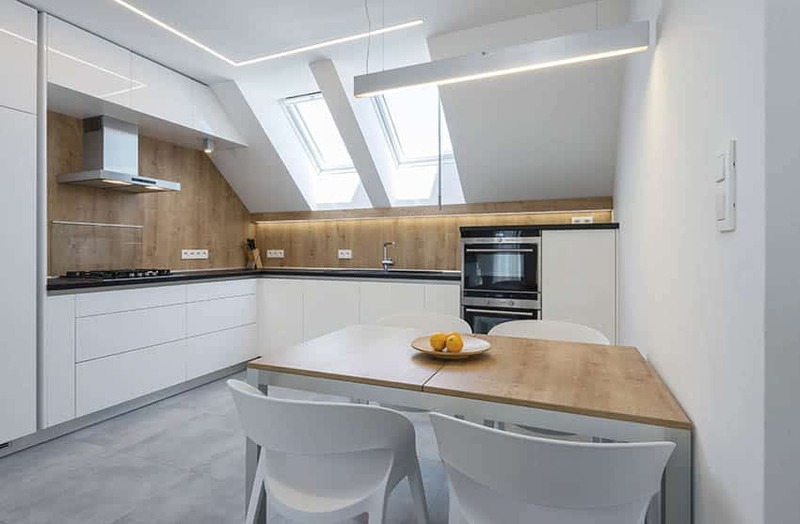 A great example of a Nordic-inspired designs, this kitchen is able to seamlessly combine the sleek look of modern design and the warmth of natural finishes, creating simple yet elegant kitchen look. 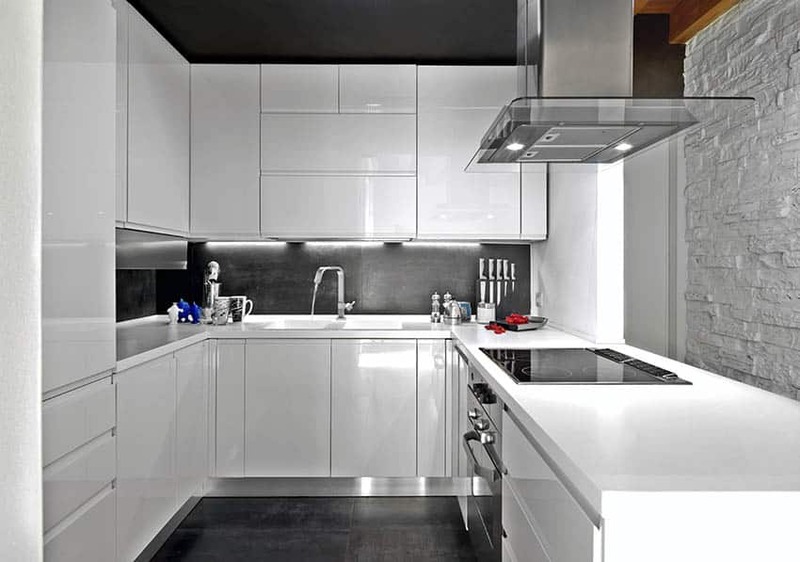 The modular cabinets are laminated in white and topped with black solid surface countertop. It has a nice warm maple wood backdrop that helps soften the hard edges of the modern silhouette. 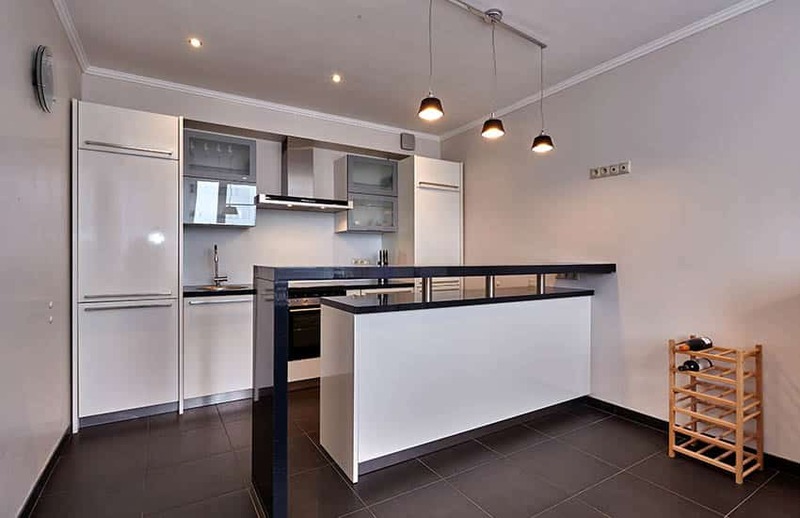 Visit this page to see more small kitchens with white cabinets.